During the last Ice Age, which ended approximately 10,000 years ago, 32 percent of Earth's land area was covered with glaciers. At present, glaciers cover roughly 10 percent of the land area. A vast majority of that glacial ice overlies much of the continent of Antarctica. 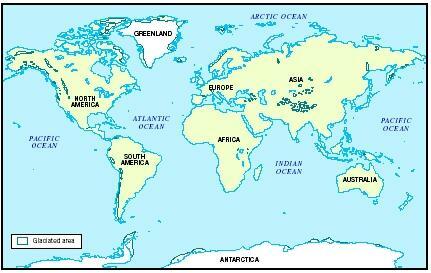 Most of the rest covers a great portion of Greenland; a small percentage is found in places such as Alaska, the Canadian Arctic, Patagonia, New Zealand, the Himalayan Mountains, and the Alps. Glaciers are not landforms. The action of glaciers, however, creates landforms. It is a process known as glaciation. Glacial ice is an active agent of erosion, which is the gradual wearing away of Earth surfaces through the action of wind and water. Glaciers move, and as they do, they scour the landscape, "carving" out landforms. They also deposit rocky material they have picked up, creating even more features. The work of present-day glaciers, however, is slow and confined to certain areas of the planet. Less obvious but far more reaching has been the work of Ice Age glaciers. Many of the distinctive features of the northern landscapes of North America and Europe were formed by glaciers that once covered almost one-third of the planet's land surface. A glacier is a large body of ice that formed on land from the compaction and recrystallization of snow, survives year to year, and shows some sign of movement downhill due to gravity. Two types of glaciers exist: relatively small glaciers that form in high elevations near the tops of mountains are called alpine or mountain glaciers; glaciers that form over large areas of continents close to the poles (the North and South Poles; the extreme northernmost and southernmost points on the globe) are called continental glaciers or ice sheets. Two continental glaciers are found on Earth: one covers 85 percent of Greenland in the Northern Hemisphere and the other covers more than 95 percent of Antarctica in the Southern Hemisphere. The area of a glacier where mass is lost through melting or evaporation at a greater rate than snow and ice accumulate. The area of a glacier where mass is increased through snowfall at a greater rate than snow and ice is lost through ablation. A relatively small glacier that forms in high elevations near the tops of mountains. A sharp-edged ridge of rock formed between adjacent cirque glaciers. The sliding of a glacier over the ground on a layer of water. A bowl-shaped depression carved out of a mountain by an alpine glacier. A glacier that forms over large areas of continents close to the poles. A deep, nearly vertical crack that develops in the upper portion of glacier ice. A large boulder that a glacier deposits on a surface made of different rock. A long, snakelike ridge of sediment deposited by a stream that ran under or within a glacier. The granular ice formed by the recrystallization of snow; also known as névé. A deep glacial trough submerged with seawater. A general term for all material transported and deposited directly by or from glacial ice. The smooth and shiny surfaces that are produced on rocks underneath a glacier by material carried in the base of that glacier. The rapid forward movement of a glacier. A U-shaped valley carved out of a V-shaped stream valley by the movement of a valley glacier. The transformation of the landscape through the action of glaciers. A large body of ice that formed on land by the compaction and recrystallization of snow, survives year to year, and shows some sign of movement downhill due to gravity. A continuous layer of till deposited beneath a steadily retreating glacier. A shallow glacial trough that leads into the side of a larger, main glacial trough. A high mountain peak that forms when the walls of three or more glacial cirques intersect. The movement of ice inside a glacier through the deformation and realignment of ice crystals; also known as creep. A steep-sided, conical mound or hill formed of glacial drift that is created when sediment is washed into a depression on the top surface of a glacier and then deposited on the ground below when the glacier melts away. A shallow, bowl-shaped depression formed when a large block of glacial ice breaks away from the main glacier and is buried beneath glacial till, then melts. If the depression fills with water, it is known as a kettle lake. A moraine deposited along the side of a valley glacier. A moraine formed when two adjacent glaciers flow into each other and their lateral moraines are caught in the middle of the joined glacier. The water from melted snow or ice. A general term for a ridge or mound of till deposited by a glacier. A valley glacier that flows out of a mountainous area onto a gentle slope or plain and spreads out over the surrounding terrain. Fine-grained rock material produced when a glacier abrades or scrapes rock beneath it. The elevation above which snow can form and remain all year. The long, parallel scratches and grooves produced in rocks underneath a glacier as it moves over them. A small lake that fills the central depression in a cirque. A moraine found near the terminus of a glacier; also known as an end moraine. The leading edge of a glacier; also known as the glacier snout. A random mixture of finely crushed rock, sand, pebbles, and boulders deposited by a glacier. An alpine glacier flowing downward through a preexisting stream valley. Both types of glaciers create landforms through erosion. These erosional features may be as large as the Great Lakes of North America or as small as scratches left in pebbles. As a glacier moves, it scours away material underneath it, plucking up rocks, some of which may be house-sized boulders. This material then becomes embedded in the ice at the base of a glacier. As the glacier continues to move, the embedded material abrades or scrapes the rock underneath. The slow scraping and grinding produces a fine-grained material known as rock flour. It also produces long parallel scratches and grooves known as striations in the underlying rocks. Because they are aligned parallel to the direction of ice flow, glacial striations help geologists determine the flow path of former glaciers. Another small-scale erosional feature is glacial polish. This is a smooth and shiny surface produced on rocks underneath a glacier when material encased in the ice abrades the rocks like fine sandpaper. Moving ice sculpts a variety of landforms out of the landscape. Larger-scale erosional features include bowl-shaped, steep-walled depressions carved out of the side of mountains. These depressions are called cirques (pronounced SIRKS), and the relatively small alpine glaciers that fill them are called cirque glaciers. If the glacier melts and a small lake fills the central depression in a cirque, that lake is known as a tarn. Two or more glacial cirques may form on a mountainside, eroding away the rock between them to create a steep-sided, sharp-edged ridge known as an arête (pronounced ah-RHET). 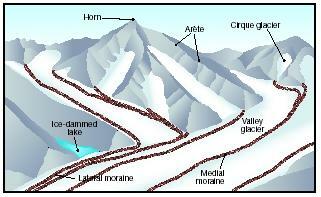 When the walls of three or more glacial cirques meet, they may form a high mountain peak known as a horn. When a cirque glacier expands outward and flows downward through a stream valley that already exists, it becomes a valley glacier. Through erosion, valley glaciers turn V-shaped stream valleys into U-shaped glacial troughs. Smaller valley glaciers, known as tributary glaciers, may form alongside a main valley glacier and eventually flow into it. The shallower glacial troughs created by these glaciers are known as hanging valleys. A valley glacier that flows out of a mountainous area onto a gentle slope or plain and spreads out over the surrounding terrain is a piedmont glacier. A valley glacier may flow all the way to a coastline, carving out a narrow glacial trough. If the glacier melts and the valley fills with seawater, it is known as a fjord (pronounced fee-ORD). Although prominent along the west coast of Norway, fjords are also found along the coasts of Alaska, British Columbia, Chile, Greenland, New Zealand, and Scotland. Glaciers leave their mark on the landscape not only through erosion, but also through deposition. Deposition involves carrying loose materials from one area and leaving, or depositing, these materials in another area. Depositional features are created by the release of rocky material from a glacier. They vary widely in scale and form. All sediment (rock debris ranging from clay to boulders) deposited as a result of glacial erosion is called glacial drift. Like a stream, a glacier picks up and carries sediment particles of various sizes. Unlike a stream, a glacier can carry part of that sediment load on its bottom, its sides, or its top (sediment on top has fallen onto the glacier from the valley walls). Another difference between the two is that when a stream deposits its load of sediment, it does so in order of size and weight: large, heavy particles are deposited first, followed by particles that are increasingly smaller and lighter. When a glacier deposits sediment, there is no such order. The particles are unsorted, with large and small particles mixed together. This random mixture of finely crushed rock, sand, pebbles, and boulders deposited by a glacier is referred to as till. Since a glacier can carry rocks for great distances before depositing them, those rocks generally differ from the surrounding native rocks in that area. In fact, because they are derived from a very large area eroded by a glacier, glacial deposits contain the widest variety of rock types. A glacially deposited large boulder that differs in composition from the rocks around it is called an erratic. 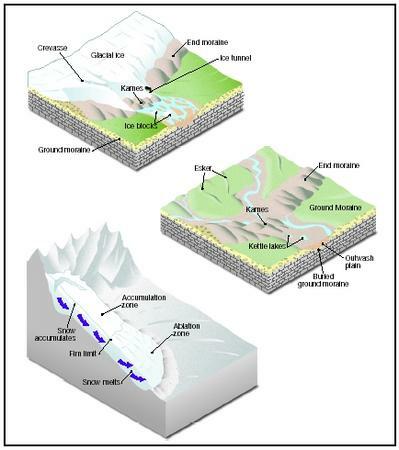 Major features of glaciation, or the action of glaciers on a landscape . runs down the middle of the new glacier. This is a medial moraine. A moraine deposited at the leading edge of a glacier, marking its farthest advance, is a terminal or end moraine. Finally, a continuous layer of till deposited beneath a steadily retreating glacier is a ground moraine. Another common glacial landform is the drumlin. This tear-drop-shaped hill forms underneath a glacier. The tail of the drumlin points in the direction of the ice movement. Geologists are unsure exactly how drumlins form, whether a glacier scrapes up material beneath it or deposits material it already carries or a combination of both. Drumlins may be quite large, measuring up to 200 feet (60 meters) in height and 0.6 mile (1 kilometer) in length. As a glacier melts, it produces meltwater that flows on top, within, and underneath the glacier through channels. This meltwater moves large quantities of sediment from the glacier. At the leading edge of the glacier, also known as the terminus or glacier snout, the meltwater emerges in large streams that carry it away from the glacier. The sediment in the meltwater is then deposited, forming a broad, sweeping plain called an outwash plain. Since the sediment was carried in water, it is deposited in a sorted manner, with the largest particles first and the smallest particles last. If a glacier melts and retreats, curving, snakelike ridges of sediment may mark the former locations of streams that existed under the glacier. These long, twisting ridges are called eskers. Two other features that result from the melting of glaciers are kames and kettles. As a glacier begins to melt, a depression may form on its top surface, filling with water and sediment. When the glacier finally melts away, the sediment is set down on the surface of the ground, forming a steep-sided, conical mound or hill known as a kame. A kettle forms when a large chunk of ice separates from the main glacier. Buried by glacial till, the ice then melts, leaving a depression in the landscape. This eventually becomes filled with water, forming a kettle lake. Glaciers are moving ice. They can range in size from small patches to ice sheets covering millions of square miles. The world's largest alpine glacier is the Siachen Glacier in the Karakoram Mountains of Pakistan. Measuring 47 miles (75 kilometers) in length, it contains more than 13.6 cubic miles (56.7 cubic kilometers) of ice. The Antarctic ice sheet is the largest single mass of ice on Earth. It covers an area of almost 5.4 million square miles (14 million square kilometers) and contains over 7 million cubic miles (29 million cubic kilometers) of ice. Loess (pronounced LUSS; a German word meaning "loose") is a deposit of fine, yellowish-gray, silty sediment. Composed of mineral particles finer than sand but coarser than dust or clay, loess forms fertile topsoils. Areas with large loess deposits are found in the central and northwestern United States, in central and eastern Europe, and in eastern China. The majority of loess was formed by the action of glaciers and wind (some loess comes from the transport of sediment from desert areas). After the last ice age, meltwater streams from the retreating continental glaciers transported vast amounts of rock flour and other fine sediment away from the glaciers. Strong winds blowing off the glaciers (because glacial ice cools the air and cold air moves to lower elevations at the front of the glacier) picked up the fine sediment and carried it far beyond the outwash plains before it was deposited. Since loess is transported in the air, it is very well sorted, and is mostly silt combined with a small amount of clay. Loess is generally deposited as a blanket over everything, both hills and valleys. It is often removed by wind and water to fill up basins and depressions. Glacial effects and features . generally very low because the air is too cold to hold much moisture, it may take snow about 1,000 years to turn into ice. In time, if snow does not melt but is buried beneath additional layers of snow, it will begin to compress. This forces the snow crystals to recrystallize, forming grains similar in size and shape to cane sugar. As new snow piles on top and the snow below becomes further compressed, the grains grow larger and the air spaces between them become smaller. Over a short period of time, perhaps the span of two winters, the compressed snow turns into a granular material known as firn or névé (pronounced nay-VAY). The density (amount of mass in a given volume) of regular snow is about 10 percent that of water. The density of firn is about 50 percent that of water. Once the thickness of the overlying snow exceeds about 165 feet (50 meters), the firn turns into a solid mass of glacial ice. Additions to a glacier's mass are called accumulation; losses through melting, erosion, or evaporation are called ablation (pronounced ah-BLAY-shun). A glacier may be divided into two distinct zones. Where snow and ice accumulate faster than they melt away or evaporate is the accumulation zone; where melting and evaporation occur faster than accumulation is the ablation zone. The upper part of a glacier is its accumulation zone, while the lower part is its ablation zone. The boundary between the two zones is called the firn limit. Over a period of years, depending on the amount of snowfall and seasonal temperatures, a glacier may gain more mass than it loses. If this occurs, the terminus of the glacier will likely advance. If the opposite happens, with the glacier losing more mass than it gains, its terminus will likely retreat. Thus, depending on the balance between accumulation and ablation, a glacier may grow or shrink. A glacier always moves in the same direction whether it is advancing or retreating. It moves to lower elevations under the force of gravity by two different processes: internal flow and basal sliding. The glacial ice beneath the firn in a glacier is so dense and under such pressure that it begins to behave like thick tar or what geologists term "plastic." The individual ice crystals in this area respond to pressure and the force of gravity by deforming yet again. They are forced into the same orientation or direction, all realigning parallel to the direction of flow. Like cards in a deck of playing cards, they then slide over and past one another. Glacial movement through internal flow, also known as creep, is very slow: on average, it measures only an inch or two (a few centimeters) a day. In a valley glacier, ice in the upper central part moves faster than ice at the sides, where it is in contact with the valley walls. Confined by high pressures, ice deep in a glacier does not crack during internal flow. However, near the surface of the glacier where there is less pressure, the ice is brittle. When the lower portion of a glacier moves by internal flow, especially over abrupt changes in slope, large cracks may develop in the upper 150 feet (45 meters) or so of ice. These deep, nearly vertical cracks are called crevasses (pronounced kri-VASS-ez). Glaciers in polar regions are frozen to the ground and move only through internal flow. Glaciers elsewhere are normally warm enough at their bases to have a layer of water form between their ice and the ground. The water reduces friction by lubricating the ground and allowing the glacier to slide on its bed in what is called basal sliding. This second type of glacial movement occurs because high pressure reduces the temperature at which ice will melt. Ice underneath a 7,220-foot (2,200-meter) glacier will melt at roughly 29°F (–1.6°C), rather than at 32°F (0°C). The thicker the glacier, the greater the pressure at its base, and the lower the temperature at which its ice will melt. Ice ages were periods in Earth's history when vast glaciers covered large portions of the planet's surface. Earth's average annual temperature varies constantly from year to year, from decade to decade, and from century to century. During some periods, that average annual temperature has dropped low enough to allow fields of ice to grow and cover large areas of Earth. Annual variations of only a few degrees can result in the formation of extensive continental glaciers. Over the last 2.5 million years, about twenty-four ice ages have occurred. This means that Earth's average annual temperature shifted upwards and downwards about two dozen times during that period. In each case, an episode of significant cooling was followed by an episode of significant warming, called an interglacial period, after which cooling took place once more. At present, Earth is in an interglacial period. The exact causes for ice ages have not been proven. Scientists believe that ice ages are the result of a complicated interaction between such things as variations in the Sun's energy output, the varying distance of Earth from the Sun, variations in the tilt of Earth's axis, the changing position and height of the continents, changing oceanic circulation, and changes in the composition of the atmosphere. Other factors may also contribute to basal sliding. Because ice acts like a blanket, a glacier traps heat that escapes from the surface of Earth. Although not much, this heat may be enough to raise the temperature of ice at the base of a glacier to a little above the pressure-melting point. Meltwater from the top or inside a glacier may also make its way down through cracks and channels to the glacier's base, contributing to the layer of water formed there. Glacial movement due to basal sliding may be ten times faster than that due to internal flow. Because of this, basal sliding plays an important role in how much a glacier erodes a landscape and creates landforms. On rare occasions, an alpine glacier may unexpectedly surge downslope, moving at a rate of 165 to 330 feet (50 to 100 meters) per day. This results in a jumbled mass of ice along the terminus of the glacier and many crevasses along its top. Although geologists do not completely understand the reasons for glacial surging, they believe it may be caused by a buildup of meltwater at the base of a glacier that reduces the normal friction and allows unusually fast basal sliding. The fastest-recorded glacial surge was that of the Kutiah Glacier in northern Pakistan. Over a three-month period in 1953, the glacier slid more than 7.5 miles (12 kilometers), averaging about 367 feet (112 meters) per day. Through the combination of internal flow and basal sliding, glaciers move over a landscape, scraping and plucking the rock surfaces over which they move. They transport unsorted sediment both internally and on their surfaces. During warmer periods, a glacier may lose part of its mass, its ice turning to meltwater, which carries sediment away from the terminus of the glacier. Even as a glacier's terminus retreats, the flow of ice in the glacier continues to move downward under the influence of gravity. Scientific measurements at the beginning of the twenty-first century showed that most glaciers worldwide were retreating. Glaciers in the Himalayan Mountains were wasting away the quickest. Scientists who conducted the research found a connection between increasing temperatures around the world and the glacial retreat. It is known that over the last 100 years, global sea levels have risen 4 to 10 inches (10 to 25 centimeters). Scientists estimate that the melting of glaciers has contributed 1 to 2 inches (2.5 to 5 centimeters) to that rise. "These islands of ice and black basalt, now and then tinged russet or blue by oozings of iron or copper, rise over 600 meters. Their hearts are locked under deep glaciers, a crystal desert forever frozen in terms of our short life spans, but transient in their own time scale. Sometimes one sees only the cloud-marbled glacial fields, high in the sun above hidden mountain slopes and sea fog, Elysian plains that seem as insubstantial as vapor. The interiors of the glaciers, glimpsed through crevasses, are neon blue. Sliding imperceptibly on their bellies, the glaciers carve their own valleys through the rock, and when they pass over rough terrain they have the appearance of frozen rapids, which is in fact what they are, cascading at a rate of a centimeter a day." —David C. Campbell, The Crystal Desert: Summers in Antarctica , 1992. Map of glaciers around the world. Glaciers cover roughly 10 percent of Earth's land area. A vast majority of that, 90 percent, overlies the continent of Antarctica . wilderness. Glacier National Park, established in 1910 as the country's tenth national park, contains some fifty glaciers and more than two hundred glacier-fed lakes. The valleys and other geologic features of the park were all eroded and carved by the action of glaciers over the last two billion years. Several times over the past two million years, huge glaciers carved the mountains and valleys and then retreated, leaving a newly sculpted landscape. The most recent continental glacier that covered the upper section of North America retreated over ten thousand years ago. The fifty alpine glaciers in the park formed during the last few thousand years. The park is filled with many glacial features: arêtes, cirques, hanging valleys, horns, and moraines. Among the more famous ones are Mount Reynolds, a glacial horn; Garden Wall, a towering arête that extends for miles; and the U-shaped St. Mary Valley. One of the most recognizable mountains in the world, the Matterhorn in the Pennine Alps on the border between Switzerland and Italy rises some 14,700 feet (4,480 meters). First successfully climbed in 1865, it is celebrated for its distinctive shape. The mountain is a classic example of a horn. Eroded by cirques, its steep sides meet in arêtes that lead to the hornlike, pointed peak. The Alps mountain system in southern-central Europe curves in a great arc for approximately 500 miles (800 kilometers). It runs from the Mediterranean Sea up along the borders and adjacent regions of France, Italy, Switzerland, Germany, and Austria, before ending in Slovenia. The Alps was the first mountain system to be studied extensively by geologists. Many of the geologic terms associated with mountains and glaciers originated in those studies. Walden Pond, the deepest lake in Massachusetts, lies in the northeast part of the state near the city of Concord. It is a kettle lake, created about ten thousand years ago when continental ice from the last ice age began to retreat. A huge block of that glacial ice broke off and remained behind, surrounded at it base by sand and gravel deposited by meltwater streams. The block melted over a period of about two hundred years, forming a steep-sided basin that filled with water. The current shape of the pond, with its steep sides, coves along its margins, and two deep areas, reflects the shape of the original block of ice. The current maximum depth of the pond is 103 feet (31 meters). The clear water that fills the lake comes from precipitation and groundwater (freshwater lying within the uppermost parts of Earth's crust, filling the pore spaces in soil and fractured rock). The lake is famous because American writer Henry David Thoreau (1817–1862) lived along its shores between 1845 and 1847. While there, he wrote Walden, or Life in the Woods (published in 1854). In this work, a series of essays, Thoreau combined writing on transcendental philosophy with observations of aquatic ecology and aspects of limnology, the study of lakes. He also championed the value of living close to nature. Because of this highly influential work, many people consider Walden Pond and the area around it to be the birthplace of the American conservation movement. In 1965, the U.S. National Park Service designated Walden Pond as a National Historic Landmark. Benn, Douglas I., and David J. A. Evans. Glaciers and Glaciation . London, England: Edward Arnold, 1998. Bennett, Matthew R., and Neil F. Glasser. Glacial Geology: Ice Sheets and Landforms . New York: John Wiley and Sons, 1996. Erickson, Jon. Glacial Geology: How Ice Shapes the Land . New York: Facts on File, 1996. Llewellyn, Claire. Glaciers . Barrington, IL: Heinemann Library, 2000. Post, Austin, and Edward R. Lachapelle. Glacier Ice . Revised ed. Seattle: University of Washington Press, 2000. "All About Glaciers." National Snow and Ice Data Center . http://nsidc.org/glaciers/ (accessed on September 1, 2003). "Glacial Landforms." South Central Service Cooperative . http://www.scsc.k12.ar.us/2001Outwest/PacificEcology/Projects/HendricksR/default.htm (accessed on September 1, 2003). "Glaciers and Glacial Geology." Montana State University-Bozeman . http://gemini.oscs.montana.edu/~geol445/hyperglac/index.htm (accessed on September 1, 2003). Glaciers, Rivers of Ice . http://members.aol.com/scipioiv/glmain.html (accessed on September 1, 2003). "Illustrated Glossary of Alpine Glacial Landforms." Department of Geography and Geology, University of Wisconsin-Stevens Point . http://www.uwsp.edu/geo/faculty/lemke/alpine_glacial_glossary/glossary.html (accessed on September 1, 2003). I needed the exact information which i got it here. Now I can complete my project easily. what is the name for the crevasse that separates the glacier from a mounation wall. Awesome site. Great information. Drumlins are caused by deposition and they formed when ice sheets mold ground moraine. now i understand geography..way better than before.. I absolutly love this site! was wondering if any,and where did ice come across the state of west vergina.since there is the potomac river on the east side,and the ohio river bordering the west side! this is a good site for earth science students when they do reports on glaciers. it helped me alot when i was looking up information. i think all websites like this should be posted on some kind of school web sit because it has many of the definitions on our papers. VERY VERY GOOD SITE FOR THE STUDENTS TO STUDY AND GET NEW IDEAS AS WELL AS GETTING TO KNOW ABOUT THE EARTH SCIENCE. THIS SITE IS EXTREMELY AWESOME,I WAS DESPERATELY IN NEED OF SOME INFORMATION FOR MY ASSIGNMENT AND LO AND BEHOLD, I HAD IT HERE.MAY ITS CREATOR BE BLESSED. please i want to know about features of glaciation in the lowland. thank you. I have been given a journalism assignment to study why the lake level of a Kettle lake near Iroquois Falls Ontario has dropped so drastically over a five year period. There had been some drilling for wells nearby, by the municipality, and in certain cases there were artesian wells that flowed to the surface, and to my knowledge they were not capped. The residential usage of water from homes around the lake seems unlikely to have caused the drop. I am somewhat familiar with the lacustrine geology of the area, but the water level drop in this lake is really quite an anomaly. this article is awesome. I needed some information about glaciers this site is good for information. This is really cool website. I am happy I found it! awesome!! i really like it!but if only uld give more details about the process that lead about glaciation..thanks alot!! the article is smart and attractive.it is also learnable even to high school students. I like this article it really helped me understand mor about landforms. what are three depositional features created by glacier activity? i like this website as the reliable data and information we get from here, keep it up the website holder and as the glacier features are separately described in one topic , similarly the aeolean landforms should also be describe in a separate topic but the butte is separately defined and plateau is separately defined here.well i appreciate this website as a free book for geographers. It is Very good site for students as like me to every one can learn about the study of Geography and I like this site so much and thanks for answering my answer. It is a very good site for the students as like me to learn many thing of Science geography .I like this site so much for answering my questions and thank you so much. Just wanted to say a great breakdown of Glaciation and all the information was excellent! Thank you for the great work and information. So the last continental glacier in the united states occurred ten thousand years ago?! I don't know the answer to my project I am doing, And i still can't figure this out. This notes is good especially for secondary students and professional studies but take a good elaboration of drawings.